The ultimate super-naked? No. Much better. 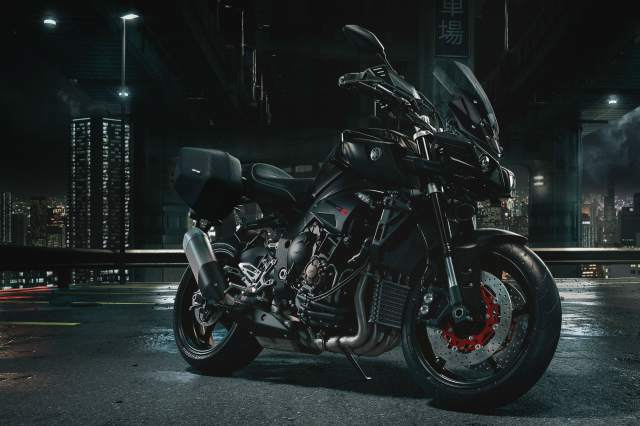 IT’S the bike many people have been waiting for. 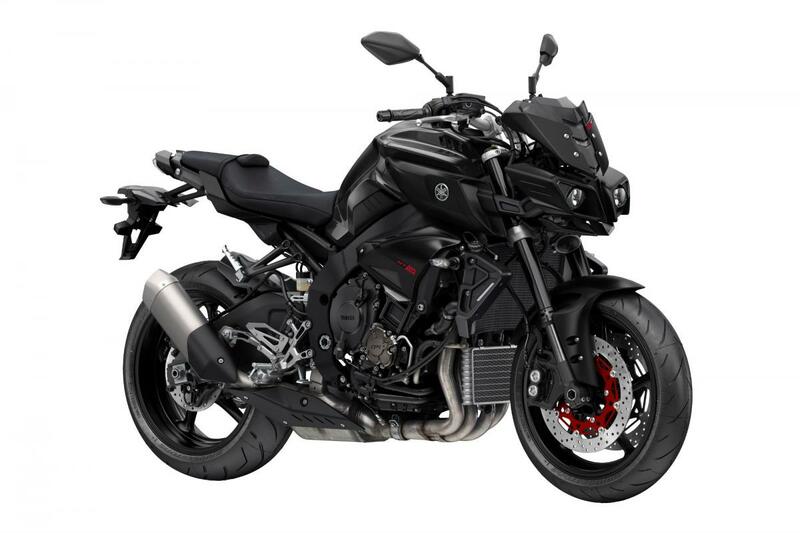 The ultimate Yamaha MT and potentially the ultimate super-naked. It’s Yamaha’s R1-powered naked bike, with the engine not from a previous generation of the firm’s flagship superbike but the latest, BSB championship-winning one, along with the frame. So is the MT-10 the ultimate brain-out hyper-naked? Of course it’s unreasonably fast, with a mid-range that might shift tectonic plates. 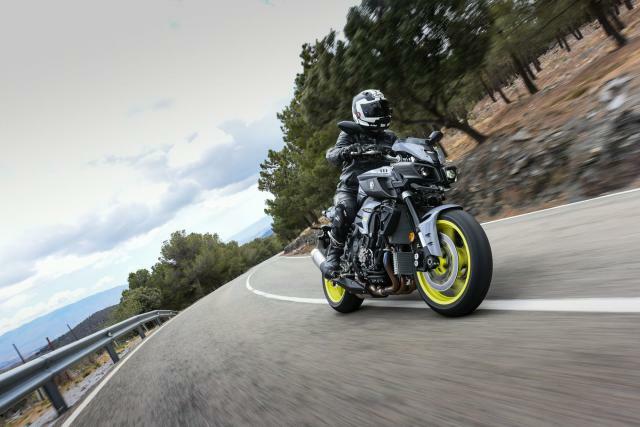 Yamaha hasn’t just put some straight bars on an R1 and left its 200hp engine unaltered. 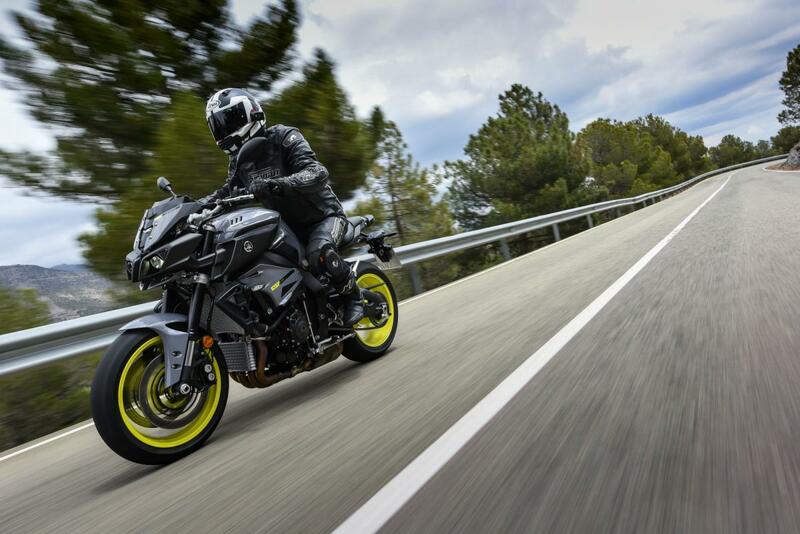 To make it more useful in an un-faired bike, the firm has rained it back to 160hp, the same as the BMW’s S1000R makes, with the reward of a better spread of torque. The 998cc in-line-four has a new cylinder design, new pistons and a new combustion chamber shape, Yamaha says. 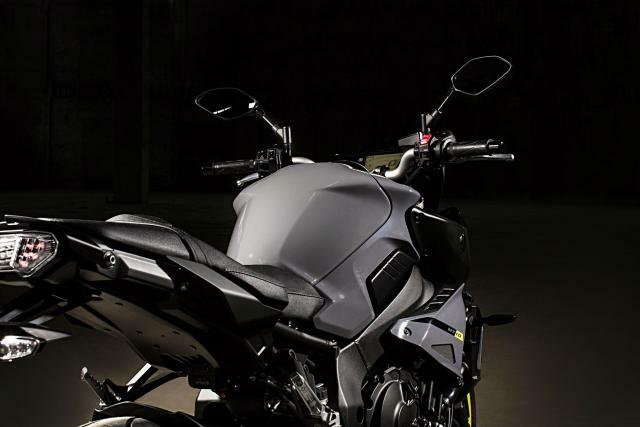 The air-box has grown from 10 to 12 litres and the exhaust pipes have changed from titanium to steel. The crank inertial mass has risen by 40% because it doesn’t need to rev as high, with a red line at 12,000rpm instead of 14,000. 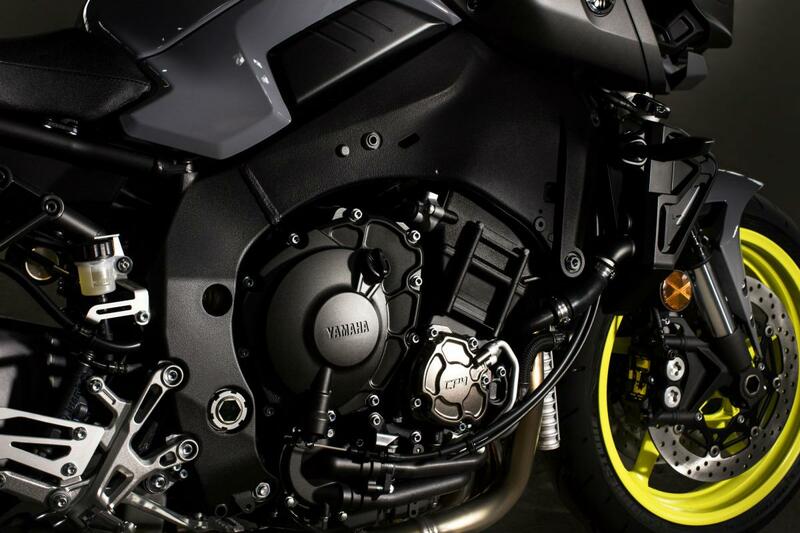 In fact, 40% of the engine parts have been changed according to Yamaha (leaving me wondering when it stops being an R1 engine) to give the MT-10 stronger low-to-mid-range torque, with a peak of 81.9lbft. With that knowledge, it’s perhaps not quite the animal I might have expected low-down in the range, at about, say, 4,000rpm. But a moment later it’s gone rabid, with the front very eager to take off at about 7,000rpm in second. 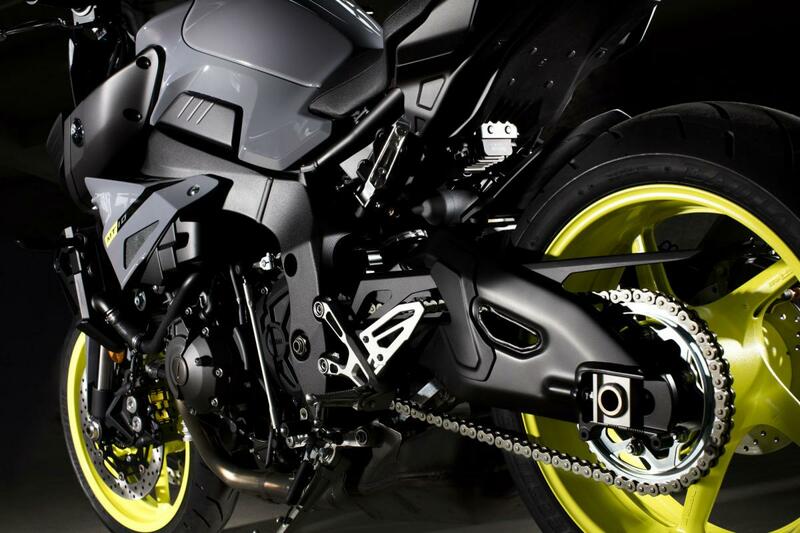 All the gears are shorter than the R1’s thanks to a rear sprocket which has 43 teeth instead of 41. Along with the lower red line, that means a top speed in first of about 70mph, compared to about 100mph on the R1. It’s a more useful gearing ratio for the road. There’s perhaps a bit of a contrast between the sound of the cross-plane crank engine and the way it feels. The noise has a rough edge. When I posted a sample of it on our Facebook page, somebody said it sounded like a ‘couple of wasps in a tin can’. 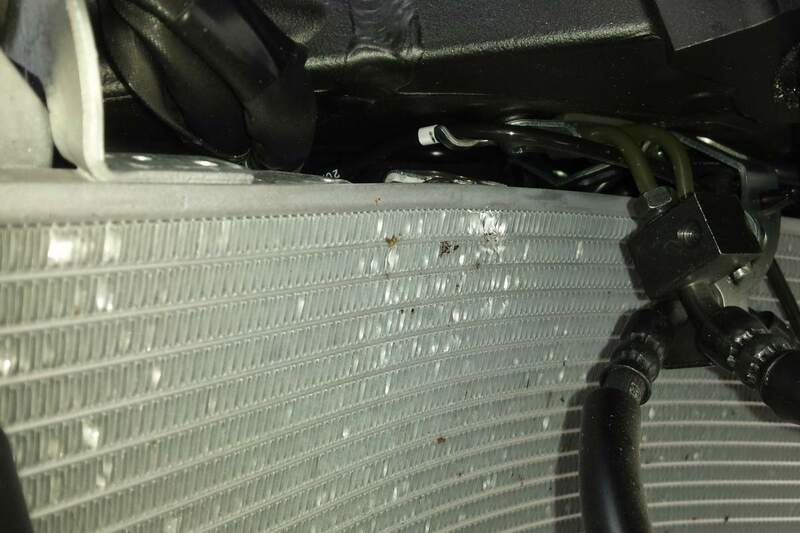 That’s probably partly down to their laptop speakers. I think the roughness of the sound lends the engine character – but there is a tinny quality to it. It doesn’t match the smooth feel of the power delivery. It’s good that it’s not a monster in the bottom-half of the range, because it makes it more manageable, and the torque higher up the range easier to access. As on the R1 itself, it’s a subtle introduction to a power-house. For all its new parts and stronger mid-range, the revy spirit of the R1 is alive in there. At 10,000rpm a white flight flashes on the dash telling you to change up. 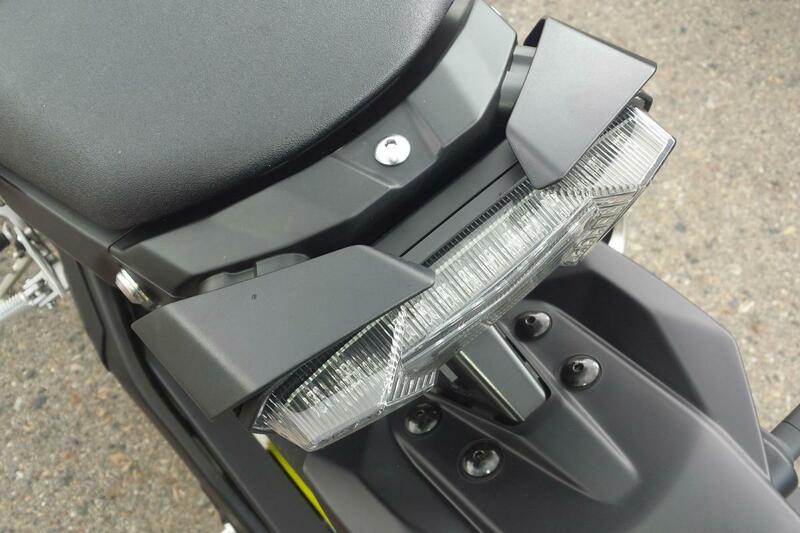 Considering the level of power there, it seems easy to keep the engine close to that white light with gear shifts. 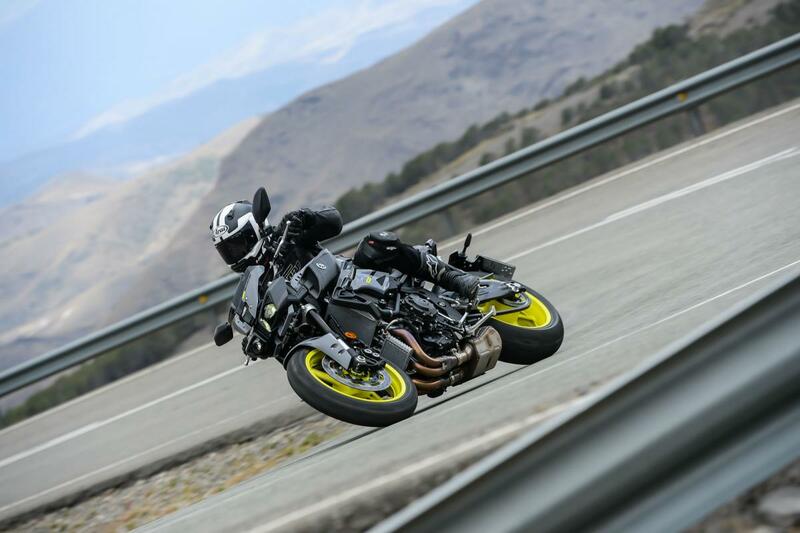 It's easy to ride fast, without brutal low-down grunt making you feel you can barely open the throttle, à la Ducati Monster 1200. A slipper-clutch helps keep the bike settled on downshifts by reducing back-torque. 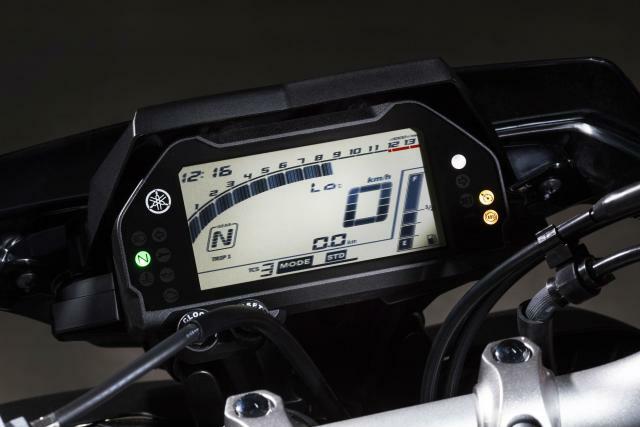 You could probably spend a year riding the R1 and still be getting to know how to make the most of its electronics, with its inertial measurement unit, slide control and maze of menus in the full-colour dash. 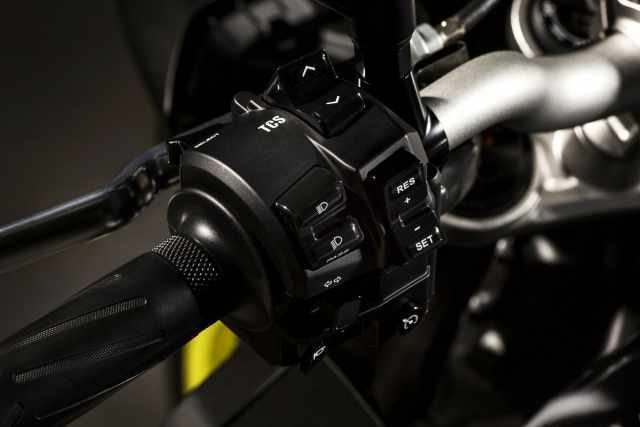 That’s been vastly simplified on the MT-10, to traction control and three riding modes, which are very easy to navigate on the non-colour digital dash. There’s obviously a place for sophisticated electronics, but it always seems a relief to get on a machine without them, that lets you focus on riding it instead of programming it. The riding modes are ‘A’, ‘B’ and ‘Standard’. 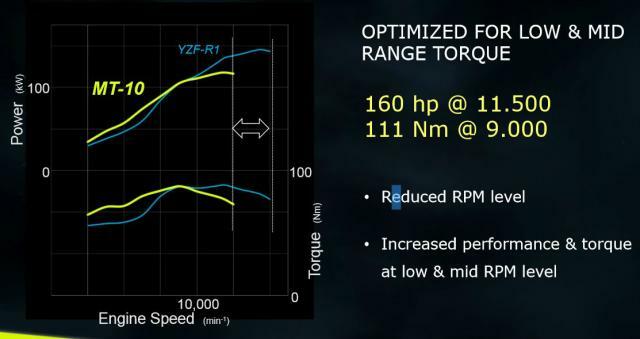 As usual, each offers a different level of torque in response to a given throttle input. Where ‘Standard’ mode is commonly the one in the middle, on this it’s the softest of the three, and ‘B’ the most aggressive. I decided the best way to get the measure of a wild animal was probably not by immediately opening the cage door, and so left the MT-10 in ‘Standard’ mode for the first couple of hours of the launch ride, in southern Spain. It makes for a very smooth and manageable initial torque delivery. 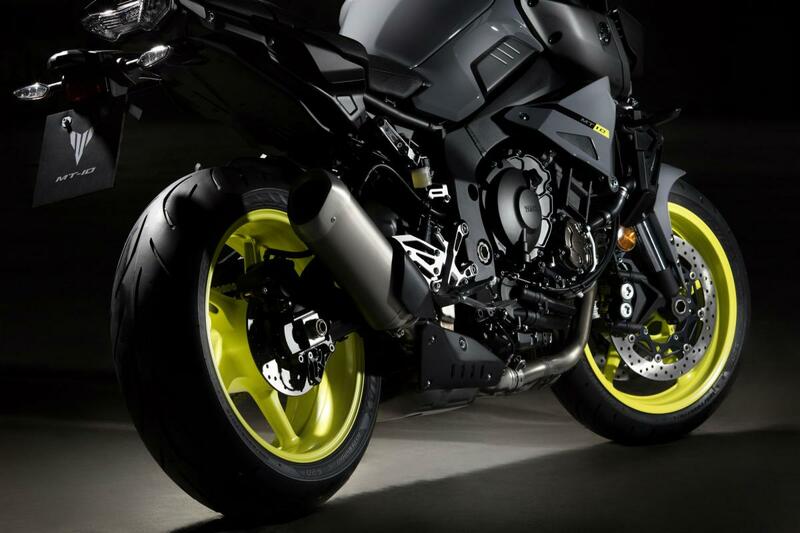 You could almost forget you were riding a naked R1 – until you open the throttle a few more degrees. After a bit of time to acclimatise and relax on the bike, I bypassed ‘A’ and went straight for ‘B’ mode, the most aggressive. The difference is dramatic, with a much punchier response to the first throttle input. Going back to ‘Standard’, it now felt a little too laid back - but I’m not sure whether it actually makes any difference to pace. The difference only lies in the first few degrees of throttle twist. 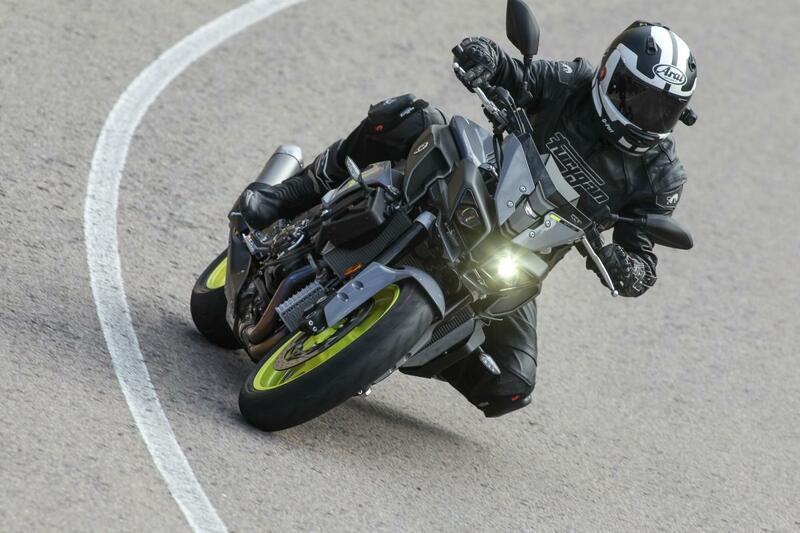 After that all modes release full torque and power, so ‘Standard’ effectively just provides a bit more throttle play. If anything, it might have made me smoother in corners, and faster. It’s just a matter of how much you want in one bite. 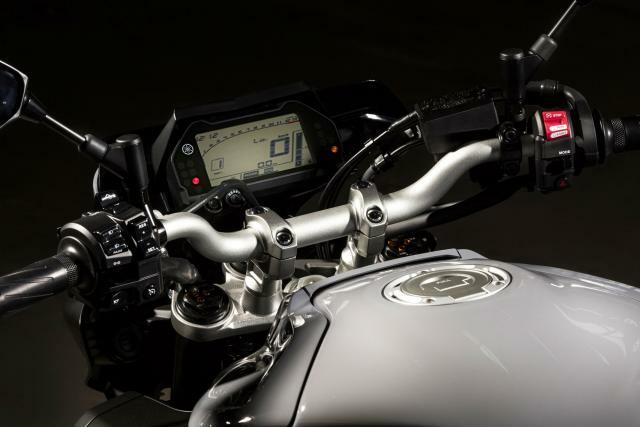 A button on the right bar changes mode, as long as the throttle is closed. Unusually, when you turn the ignition off, it comes back on in the same mode you left it in, instead of reverting to the safest, like some kind of 160hp nanny. A button on the left bar changes the level of traction control intervention from one to three, or switches it off altogether. Again, you can change levels on the move with the throttle closed, but you have to stop to switch the TC off. 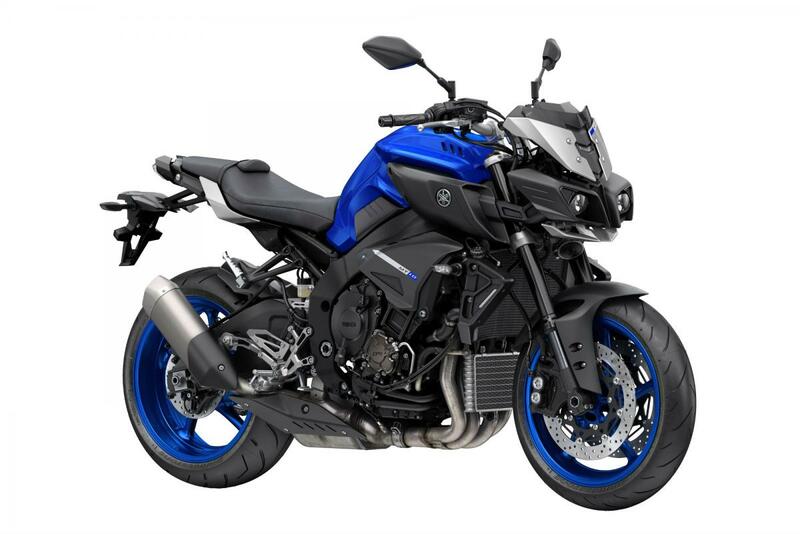 As with the engine, Yamaha has made a few adaptations to the R1 chassis for its new assignment. 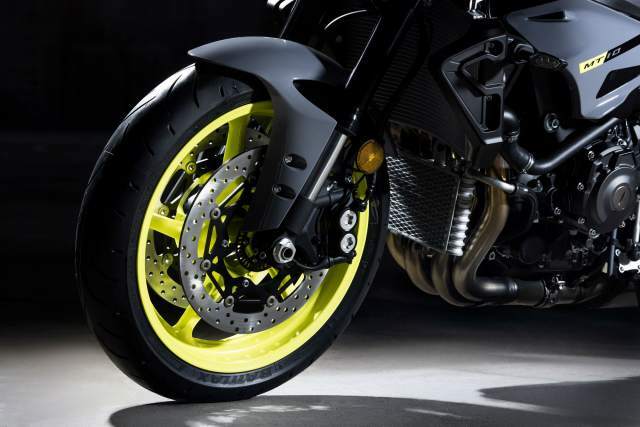 Sixty per cent of chassis parts have been altered according to the firm, including the yokes and steel sub-frame. The rider has been moved forward to put 51% of the weight on the front wheel. The heavier crank and steel pipes bring down the centre-of-gravity. 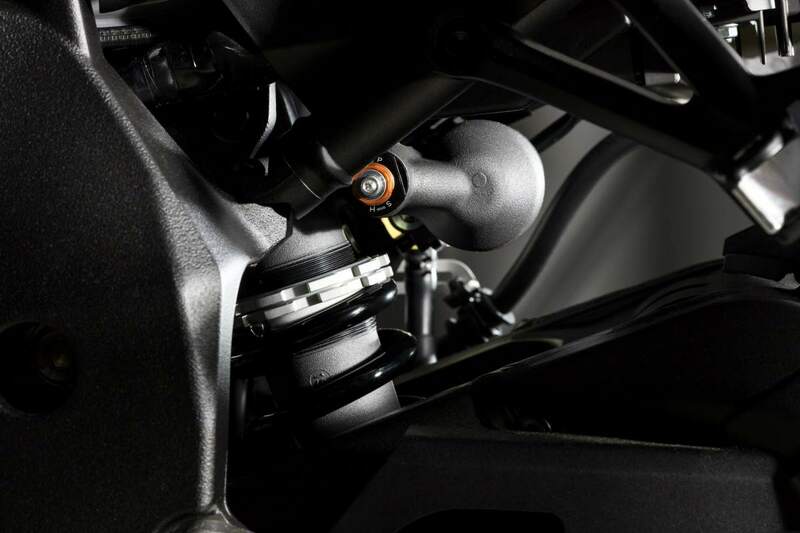 The most important bit – the aluminium Deltabox main frame – is unchanged, and possibly the best of the machine’s many assets. It’s also got the R1’s swing-arm and fully-adjustable KYB front and rear suspension, with settings tweaked. One of the things to strike me about the R1, when I first saw one close-up, was how small it is. 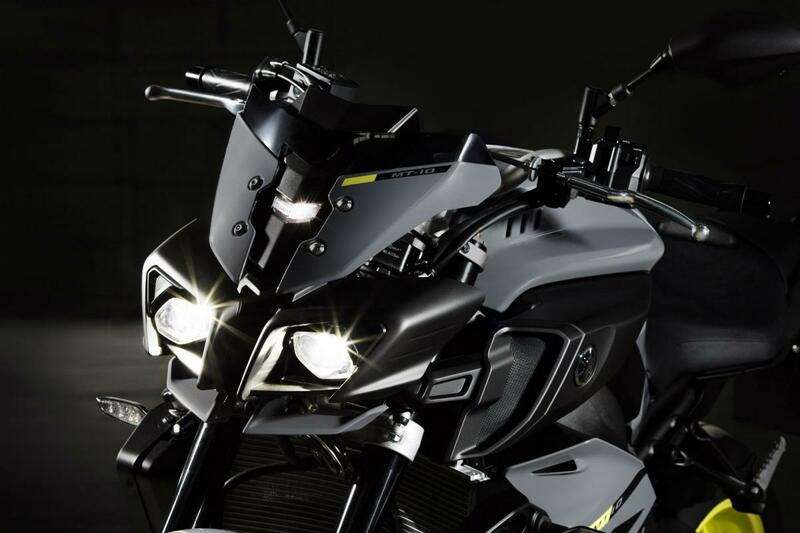 The MT-10 looks compact for a 1000cc machine too – and feels even smaller. It turns effortlessly, like a machine weighing much less than its claimed 210kg with a full tank. Turn after turn after turn, on a sunny mountain road, the physical work seemed light. The wide bars make for easy counter-steering, helping to chuck the bike quickly into a lean. I rode one at the weekend and found it was awesome. It is Wheelie Good Fun. and felt more confident than the Speed Triple I rode. It does not feel a heavy bike despite it's weight. Not ridden one yet, but seen a couple and talked to the owners. They seem happy with it. 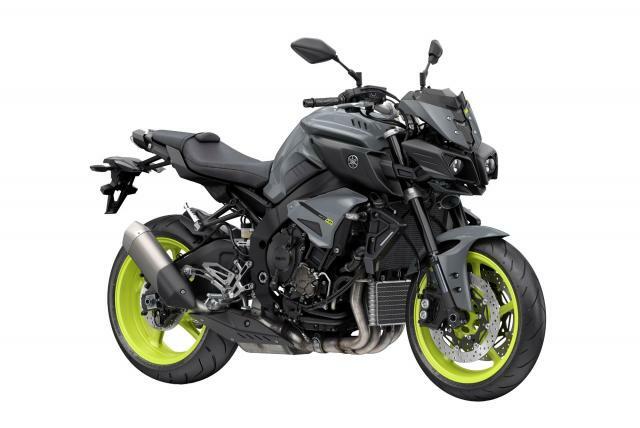 It does look small though and does not have same presence as my FZ1NA naked.